Keeping in the theme of fatigue, I want to discuss some other tips for increasing energy – might be especially helpful during this time of year! Dehydration is one of the main nutritional reasons for fatigue, so it is important to make sure you are drinking enough water. Eight glasses a day is a good minimum and you will need more if you are active. Big meals tend to make you feel sluggish, so eating smaller meals more often can help with energy as well as choosing low fat foods. Avoid processed foods. Paying attention to how certain foods make you feel is important since food allergies/intolerances can be energy suckers as well. Energy is lost when free radicals and oxidative stress damage our mitochondria. A diet focused on antioxidant-rich foods can really help repair this damage and maintain healthy cells. Some anti-oxidant rich foods to consider are yellow and orange fruits and vegetables (see my blog on ktipfitclub.com! ), blueberries, red grapes, spinach, green tea, turmeric, ginger, and garlic. Dark rich foods usually have potent antioxidants and therefore help boost energy. Limit sugar since it is used up quickly leading to a slump in energy after consumed – stevia is a safe sugar substitute. Try not to become dependent on caffeine, it can turn into a viscous cycle. It may be okay to have some caffeine but don’t overdo it and come to rely on it. Coffee is best when black since cream will interfere with the absorption of antioxidants in the coffee. I don’t recommend soda at all, regular has corn syrup, and diet drinks include dangerous sugar substitutes. Instead of coffee, you can try tea – some teas have caffeine but in less amounts that coffee. B vitamins not only help with energy, but also help with depression since they enable the brain and nervous system to work properly. Find a vitamin B product that also contains folic acid – folate can also increase energy. Some foods to try include – spinach, pinto beans, asparagus, broccoli, okra, and brussel sprouts. Below are some supplements that may help with energy. Carnitine is needed for the body to produce energy and helps rid the body of toxins to ensure things are running adequately. Start with 500mg twice daily – at breakfast and lunch. This should really help with energy levels. Co-enzyme Q10 revives energy in your cells and is a great supplement to take with carnitine. 30mg twice daily is recommended – I have also seen 100mg daily. You can also take ubiquinol which is the active form of coenzyme Q10 – then your body doesn’t have to do the converting. Alpha lipoic acid is another supplement that can boost energy by helping with oxidative damage. 100mg twice daily is recommended. D-ribose 5 grams daily in powder form can also be useful. D-ribose regulates how much energy we have in our body. Studies using 5 grams three times daily as the initial dose showed pretty dramatic increases in energy in chronic fatigue patients. Mate (Ilex paraguayensis) can be used as a tea (one to two teaspoons) to help fight physical and mental fatigue. It does contain caffeine so is best used as an occasional pick-me-upper, not long-term daily use. Ginseng (Asian or Siberian) has been shown to increase energy. It reduces fatigue and improves alertness, coordination, memory, and your ability to cope with stress. You can use one teaspoon in hot water to make tea. Magnesium is crucial for energy production, so I recommend you take 400mg daily. Juicing greens will also give you a magnesium boost to increase stamina and energy. Although supplements are sometimes necessary to ensure you are getting adequate amounts of all essential vitamins and minerals, it is always a good idea to get as many nutrients from foods as you can to get the added benefit of everything that is present in the food and how they work synergistically with each other instead of just a single nutrient. Foods high in magnesium include purslane, string beans, spinach, cowpeas, lettuce, stinging nettle, poppy seeds, licorice root and coriander. Glutamate helps with brain fatigue since it helps stabilize glucose levels so you don’t have dips and peaks. You can try 800mg with breakfast and 400mg with lunch. Another energy booster is wheatgrass. I actually drink barley grass instead since I don’t tolerate wheat well, and it has the same effects. These grasses help energize and oxygenize your cells. It tastes like you are drinking grass, however you get used to the taste and even start to enjoy it. Remember, I always recommend consulting with a health professional if you are adding herbal products or any supplements to your lifestyle – especially if you take any medications. Acupuncture can help with fatigue, as can magnet therapy – an ancient Chinese practice. And of course good sleep hygiene is important – follow Lindsay’s tips on my blog! Melatonin might help regulate your sleep/wake cycles – you can try it if you are having problems getting or staying asleep. Taking control of your environment is important for beating fatigue as well. Pleasant music that you enjoy can be energizing, warm colors energize the brain, and natural scents stimulate alertness. Clean up clutter in your work area and try implementing yellows, oranges and reds. You don’t need fancy aromatherapy devices, just keeping a bowl of lemons or oranges on your desk and slicing them will release a pleasant energizing aroma – or try a mint plant. Gentle rhythms are a good music choice, without words or loud drums – however, I believe listening to whatever you enjoy will help make you feel energized. 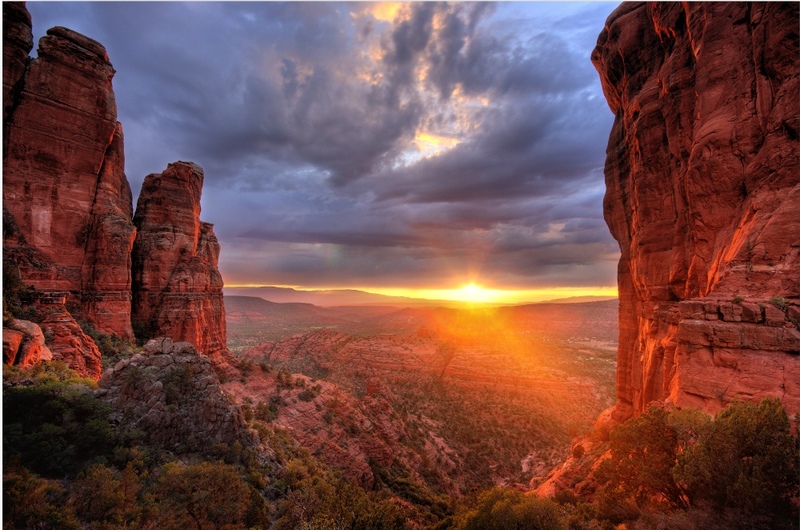 Now I am off to Sedona, Arizona – a healing place known for its energy vortexes. Let’s see what I can find to blog about while I’m there! This entry was posted in Health and tagged energy, fatigue, fruits and vegetables by Tina's Pharm. Bookmark the permalink.